Next Sunday would have been my Great-Grandmother Ethel’s 101st birthday. She passed away in 2006. We called her Gaga (now, don’t ask me how, but somehow that spelling is phonetically pronounced Gah-ghee, as in, rhymes with foggy). Born in Pleasant Plains, Arkansas, she came to California in the 1930’s. She later became a hairdresser in the Bay Area. Gaga was a simple woman who lived a difficult life. She hand-stitched some of the most beautiful quilts I’ve ever laid eyes on and made custom Raggedy Ann-type dollies with “Love ya” (or sometimes, “love ye”) embroidered on the chest for her great-grandkids. But none of us can forget, or come close to reproducing, Ethel’s pies. We’ve tried. Words can’t do justice to describing her meringues, so I won’t even bother. On my 30th birthday, my mom gave me a gorgeous gift basket filled to the brim with all of my favorites. You know, the kind of things that only a mom can think of. She knows her daughter like the back of her hand. One of the gifts was small and wrapped in tissue paper. 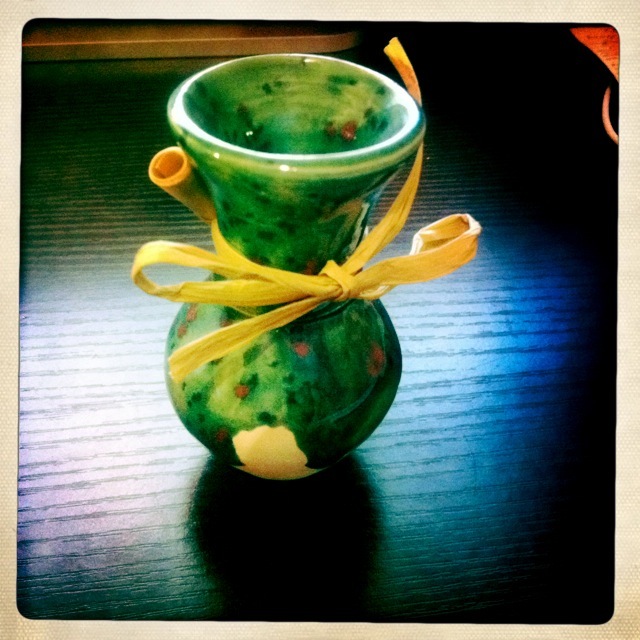 I opened it to find a stunning piece of pottery, a small earthen jar glazed in my favorite color of aqua blue. I gasped. Then she told me this story. When my mom was a little girl and would cry about this or that, Gaga used to quickly grab a mug or cup and hold it up to her cheek, saying, “Can’t catch a tear!” It never made sense to her as a child, because she always thought, “well, yes you can catch a tear!” But as she got older, she realized that it was an old-school mommy’s trick to get a kid to stop crying. Years later, as Gaga lay on her death bed and breathed her last, a small tear fell from Ethel’s steel-blue eyes. Quickly, my mom and grandmother grabbed a cloth and caught Gaga’s last tear. “Precious in the sight of the LORD is the death of his saints” (Ps 116:15). Months before my birthday, my mom had been at a conference in Fresno by a Christian speaker and potter known as The Pottery Lady. After the conference some of her pieces were on sale, and mom picked my piece up, knowing how much I would love it. The name of the piece was The Tear Jar. I’ve already used it to catch some very, very precious tears. The Bible says that “Blessed are those who mourn, for they will be comforted” (Matthew 5:4). We’ve all heard that one a thousand times, but if you read it again and chew on it for a while, it’s really kind of an odd statement. If you mourn, it means you are blessed. Now, I don’t know about you, but when I’m in mourning, generally “blessed” isn’t the feeling I’m getting. But no, the Bible says you are blessed because you will be comforted. In the New Testament, the Greek word for “blessed,” makarioi, is used in reference to the joy that comes from salvation. What this means is that Our God is so unimaginably great that to receive His comfort is a miraculous gift of grace to us. It is unmerited favor. It is a blessing of His great mercy and love. In Romans 5, verses 3-5, Paul writes “we also rejoice in our sufferings, because we know that suffering produces perseverance; perseverance, character; and character, hope. And hope does not disappoint us, because God has poured out his love into our hearts by the Holy Spirit, whom he has given us.” Jesus described the Holy Spirit as the Comforter (John 14:26). This entry was posted in Uncategorized and tagged suffering on January 7, 2013 by Amy Barnes.